On September 21, 2012 Erik Jerezano gave an artist talk at Nipissing University. The talk was presented by Line Gallery and Nipissing University. Erik Jerezano’s reception was held on September 22, 2012. 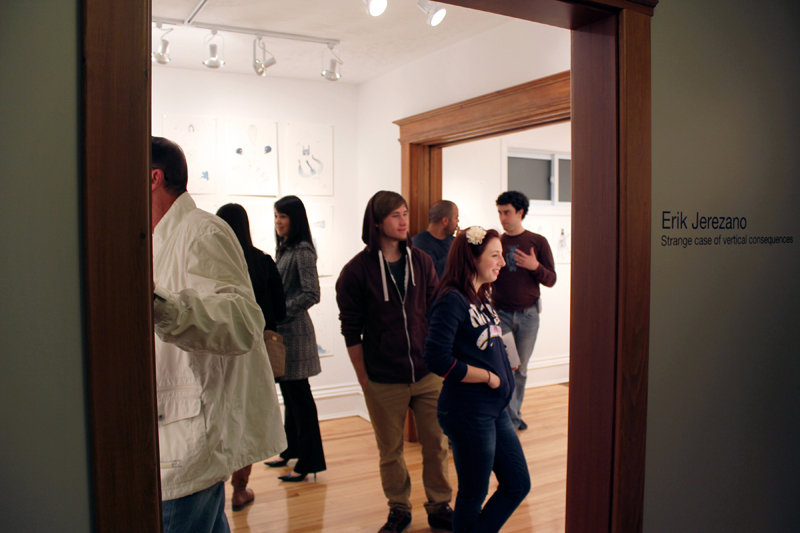 The following images are of Aleks Bartosik’s exhibition it’s not safe in the rabbit hole which ran from March 21 to April 14, 2012. 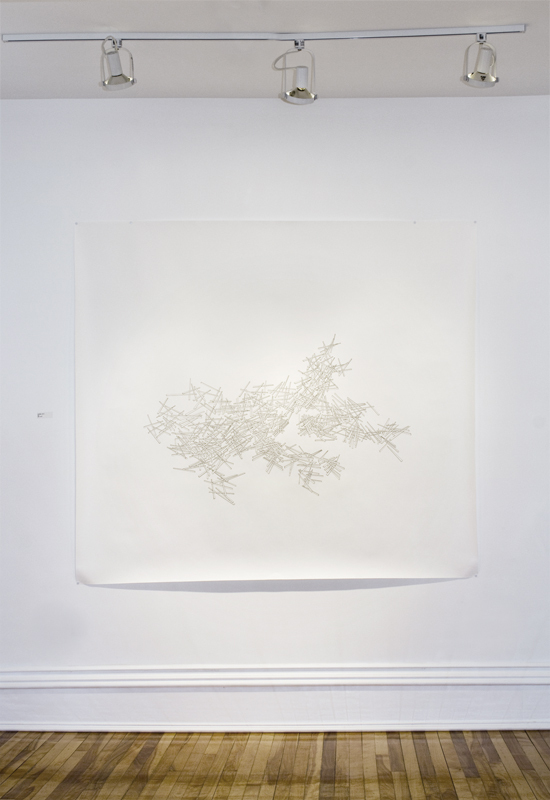 Line Gallery: Why do you think drawing is important in contemporary art or as a practice? 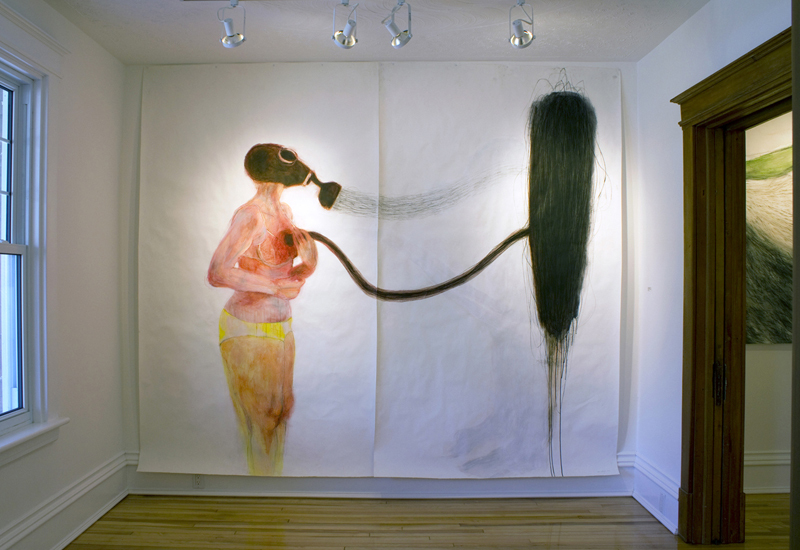 Aleks Bartosik: I think that drawing has always been important in art and art criticism; however, drawing was never really viewed as a finished or complete ‘work of art’ until recently. Drawings show so much about the artist and the rawness of that artist simply by the technique’s simplicity. Drawing has existed forever as a means of communication, and I think this still exists and is essential. LG: There are a few works that we have included in the exhibition that walk a very close line to being seen as paintings. Can you say a little about where that line is between painting and drawing for you? Do you see them as different practices? Does drawing offer different outcomes or possibilities? How do you define the differences between drawing and painting? AB: There is no line between painting and drawing for me. I view both mediums as equal, or more importantly, as co-existing with one another to make complete thoughts. I can’t help but mix both practices on my surfaces that I work on. There is a sense of completeness in a painting for me even if there is still a skeletal under-drawing visible, or there are drawing elements worked into that painting as I create it. The same occurs when I make drawings, they feel incomplete if there is no paint present in them. Since both mediums exist only when they co-exist, then it is hard to say that one is more important than the other. However, it is true that there are different outcomes and possibilities between a work of art that is dominantly a drawing and a work of art that is dominantly a painting; that is depending on the choice of the surface on which I work on. The difference between working on canvas and on paper creates that opportunity for different outcomes and possibilities for a work of art. 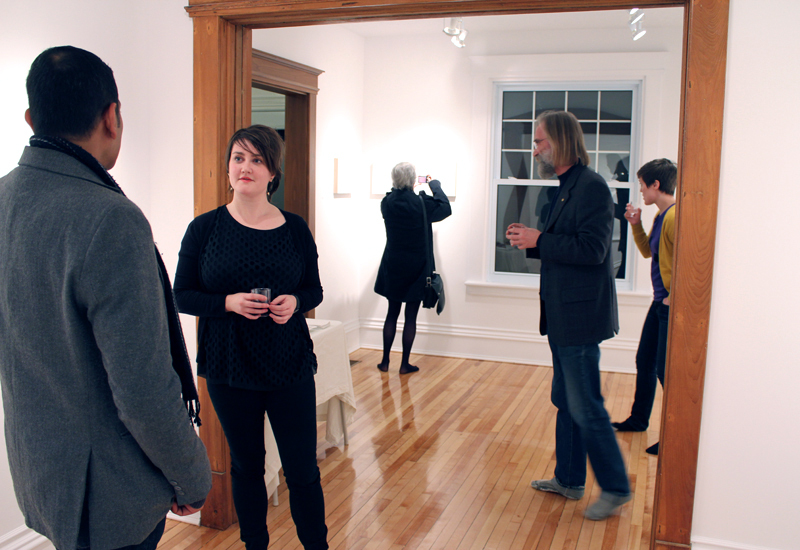 On March 24, 2012 Aleks Bartosik gave an artist talk at White Water Gallery. 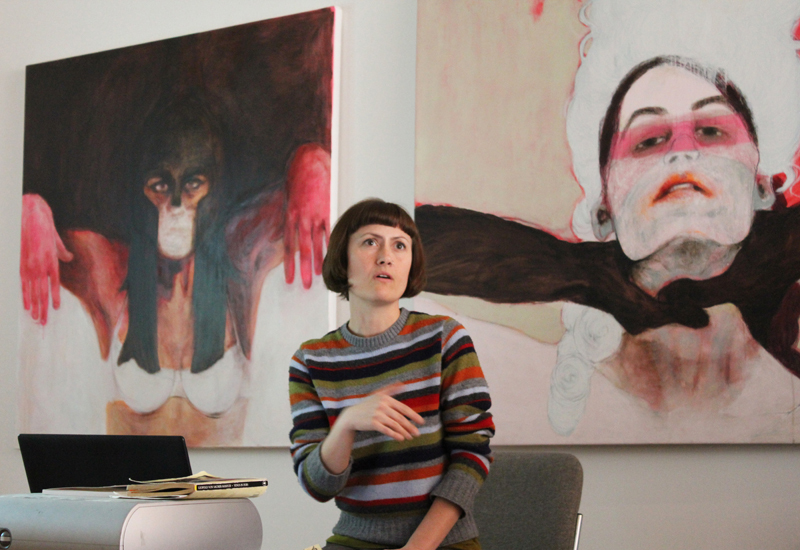 The talk was presented by Line Gallery in partnership with White Water Gallery, which was also hosting a tandem exhibition of Bartosik’s work. 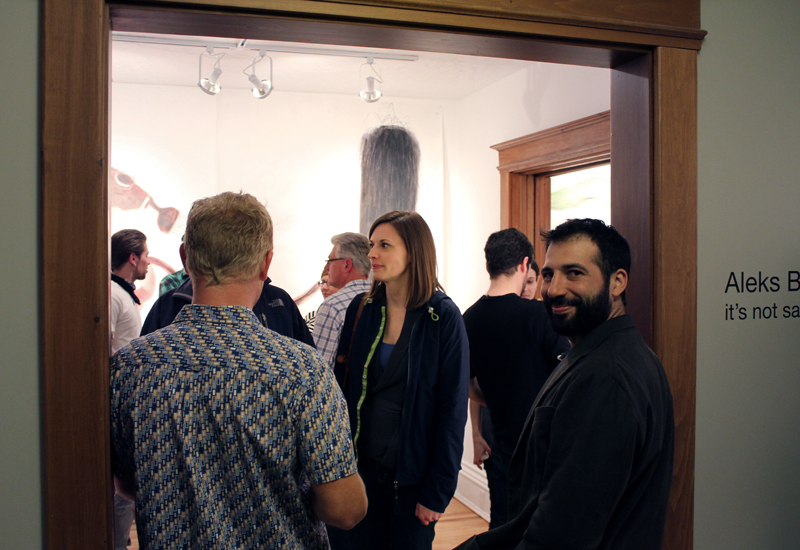 Here are some photos from Aleks Bartosik’s reception at Line Gallery. The reception was held on March 23, 2012. 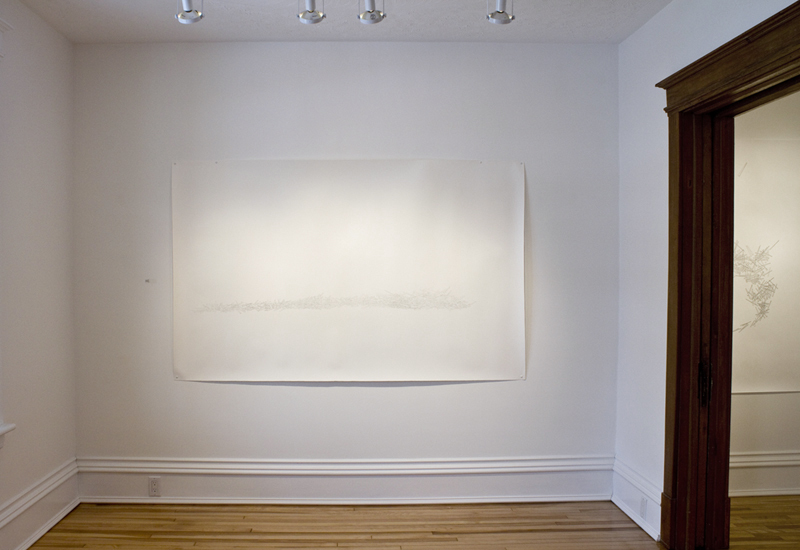 The following images are of Liv Bonli’s exhibition debris which ran from February 15 to March 3, 2012. 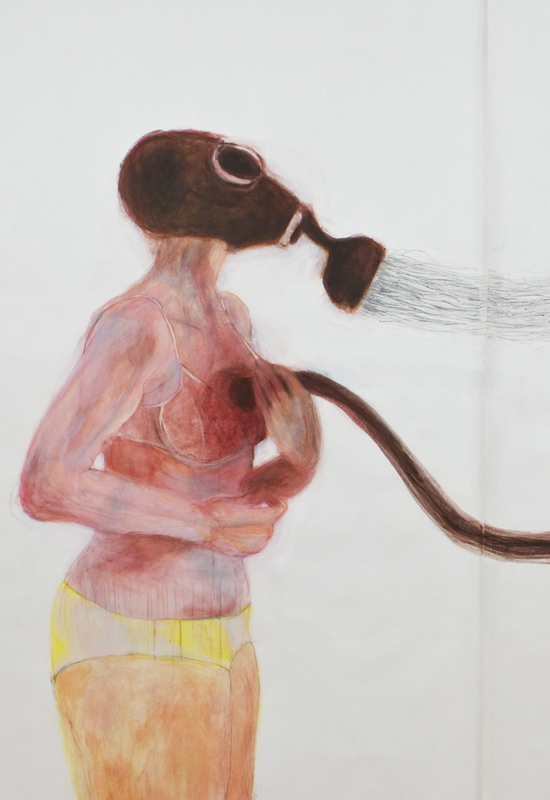 Liv Bonli: I’ve always drawn — as far back as I can remember. I was a kid with pencils. Drawing has been a constant in my practice, and informs my thinking about work in other mediums as well. Beyond that, however, I’m drawn to its simplicity and versatility. Drawing is something that can be done almost anywhere and that you can take with you. It’s also extremely relatable: most people have experience with drawing. You can be dealing with very complex or very simple ideas, and there is always a point of entry for the viewer. LG: Are there any artists or experiences that have shaped/influenced your practice? LB: I’ve been lucky to benefit from the instruction and mentorship of Alison Norlen and Patrick Traer during my time at the University of Saskatchewan, and David Merritt during my graduate studies at the University of Western Ontario. I was an undergraduate when I first realized that drawing could be a focus in its own right. That was important. 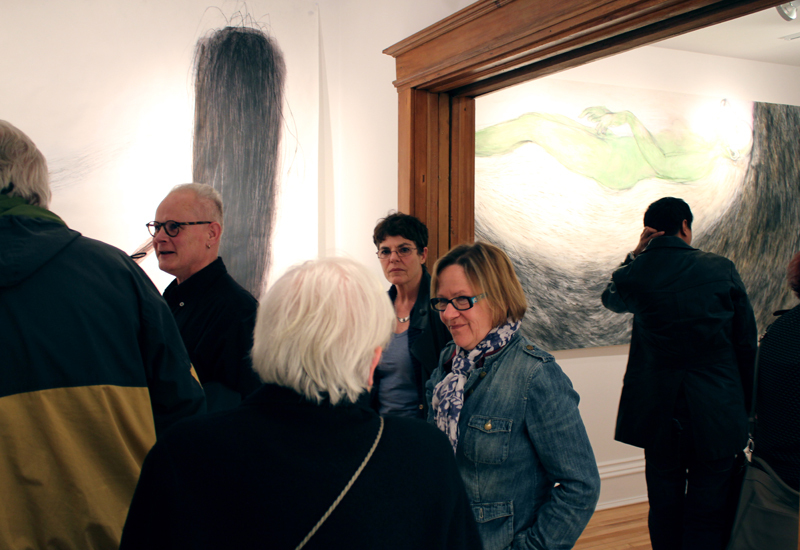 On February 11, 2012 Liv Bonli’s exhibition debris opened at Line Gallery. Here is a photo from the reception. 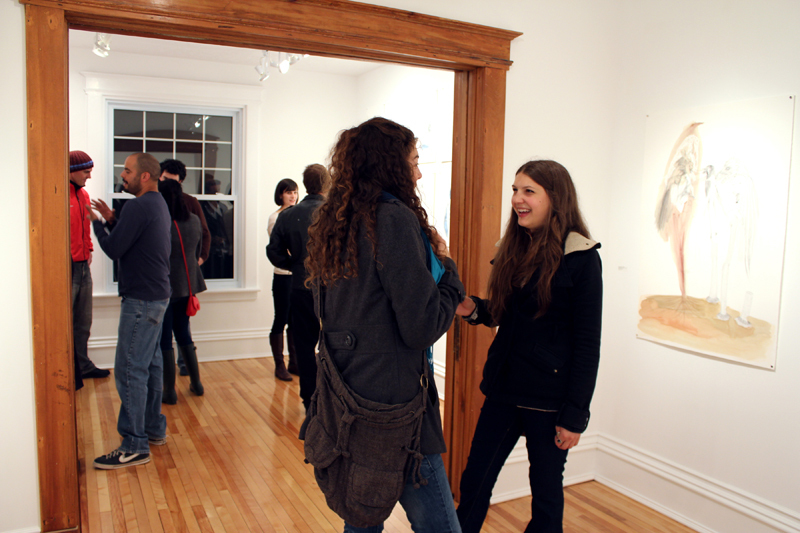 The following images are of Katie Belcher’s exhibition Field Work which ran from January 18, 2012 to February 4, 2012. 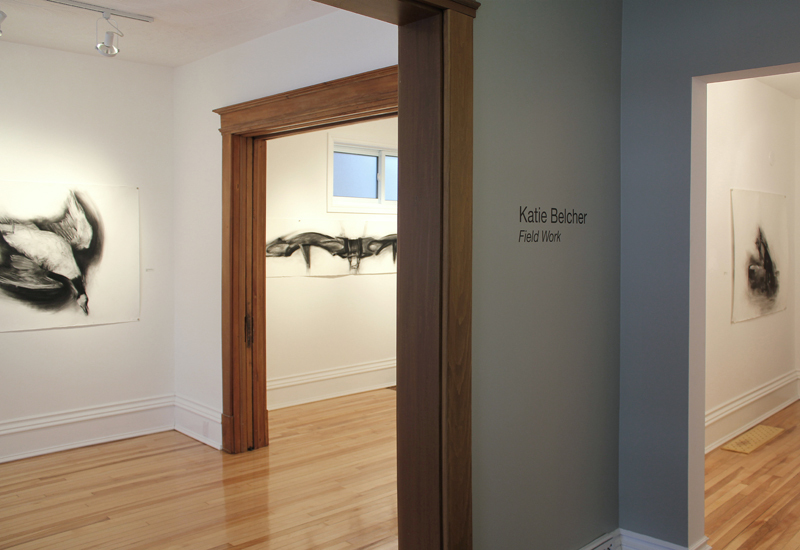 Katie Belcher: I came into drawing as my medium quite reluctantly. I had always associated drawing with sketching or illustration. I thought it was tight and limited. It was my first drawing teacher, Susan Wood, who changed that for me. She encouraged me to use loose media (both dry and wet) and to work on quality paper at a much larger size. I learned to persist with one drawing, layering and reworking it until it was fully realized. With that change in process, I fell completely in love with drawing. It is energetic, raw and immediate. 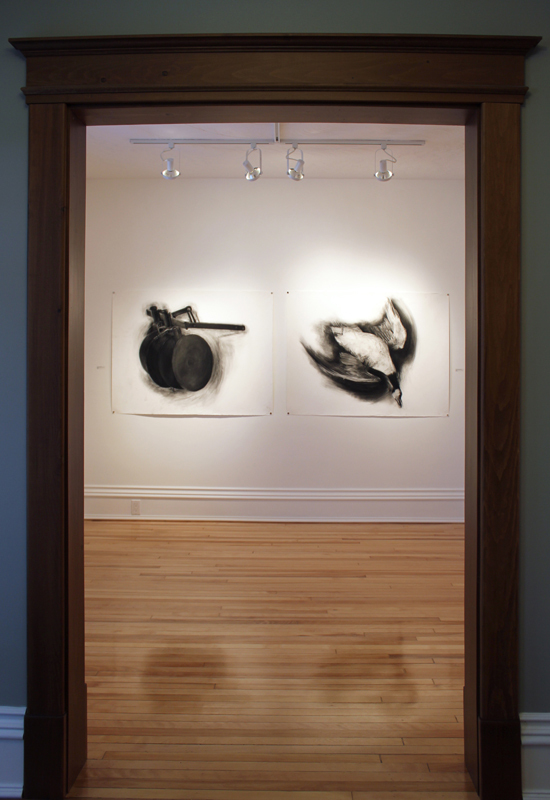 I pursued drawing through my studies at the Nova Scotia College of Art and Design, but also continued to work in sculpture. Outside of school, I’ve found drawing to be more practical than sculpture in terms of space, cost, and storage. I still perceive three dimensionally however, which is likely why I draw reductively. I find that my process of drawing satisfies the parts of me that still love sculpture. KB: Drawing is a medium unlike any other. It can be very current, or historical. It can straddle both of those definitions, as I intend my own work to do. Drawings are the beginning to all other art forms, and yet, they can stand on their own as completed works. To me, one of the richest qualities of drawing is that it is free from the condition of being “finished”. A drawing always holds within it the possibility of being erased, or added to, and as such is limitless.